I have had a lot of social success this term and I have loved project time. I have made a lot of progress in this area. I try to improve the homework score by putting heaps of effort into my work. I have really stepped up and improved this year. In maths I have tried to work hard in the graph area. I have improved from last year and I think that I have done well. I love all the work we have done in the classroom and have tried extremely hard. I am very happy with all of my work this term. Writing and projects and everything is awesome when I come to school and I love it. 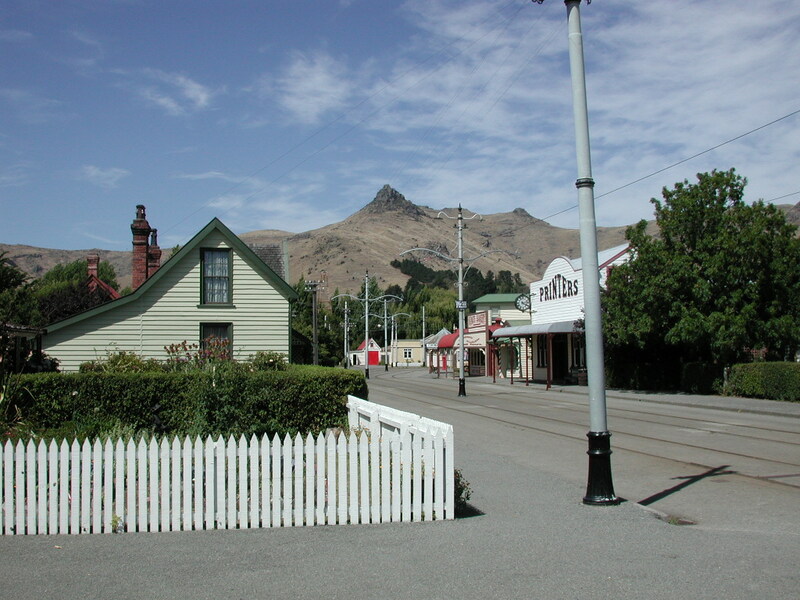 Today we went to Ferrymead Heritage park. The whole point of this was to see what olden day New Zealand has transformed into a modern day environment. We explored the household appliances of the 1900's and explored a hut and lifestyle of the settlers. We also went to a old fashioned school and had Mr Black who was very strict. There was also a post office and telegraph station that taught us about communication. My favourite part of the trip was the classroom. We had Mr Black and the three rules, children must be seen and not heard, sit up straight with feet on the ground, and face the front. We had a time table lesson, a reading lesson and a writing lesson. We also had a play session. We had to use ink pens. He always threatened us with canes and straps. My second favourite thing was the costumes. We were all dressed up as 1800's children with girls wearing dresses, aprons, and white bonnets. The boys were all wearing grey body suits and caps. They were very funny but the costumes now have changed a lot. My third favourite thing was the chore rotation. We were accompanied by Mrs Grey who gave us chores around the house. It was cool because their was olden day materials. Some of them were, ironing, making the beds, dusting, 'vacuuming', dishes and washing the clothes. I loved it a lot and these materials were mostly made. Their were outfits that looked, in my opinion, silly. There was a rule about ladies first and politeness. I am excited for high school. Although I think I will be ready I am also very scared. I know that I have to use persistence though and God is always with me. I am already thinking about being a Student leader and I have to have the attitude of a leader. No matter what I will always have a belonging; even through those tough times. I am still going through primary school and learning about what the values and Waka Hourua. To me He moana pukepuke ka ekengia e te waka means fighting tough times. I need to have courage and do my best. I am still on the ship leading me to new heights and levels. I am climbing the wave and sometimes falling down but I still have courage. I am learning and filling my brain with knowledge that I will need in the future. I have past knowledge and I use it for my learning. I know high school will be fun and there will be people who are kind and some not so much but I will learn all my skills at St Mark's so I will be ready for high school. I am still struggling but I will persist through it. He moana pukepuke ka ekengia e te waka. I am ready. 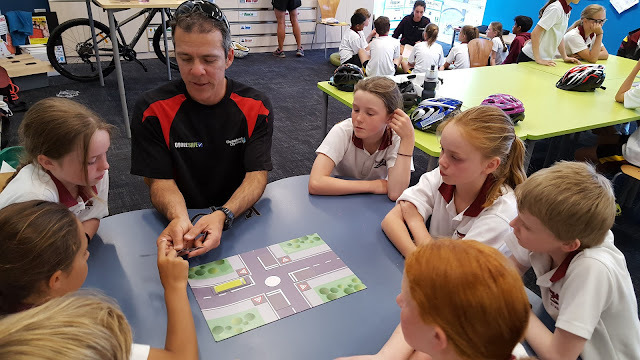 On the 27 to then 28 of November we had cycle safety. 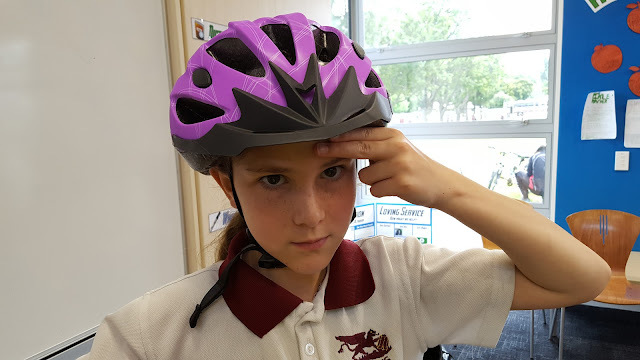 We learned about how to put on a helmet. the top of the helmet has to be two fingers up from your eyebrows. Here is a student demonstrating this. 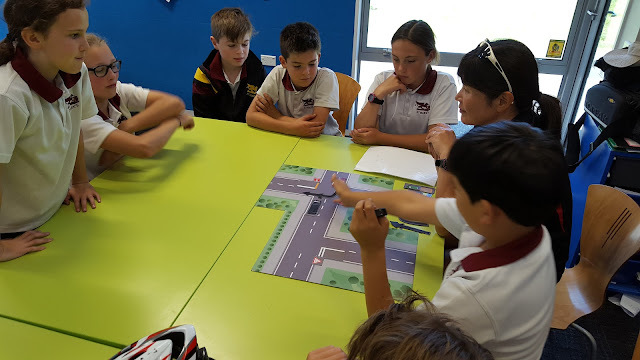 Here students learned about the traffic, roundabouts and intersections. Then after lunch on day two we rode on the road. We rode across the busy roads and peaceful roads and used the stop signs and give way signs. 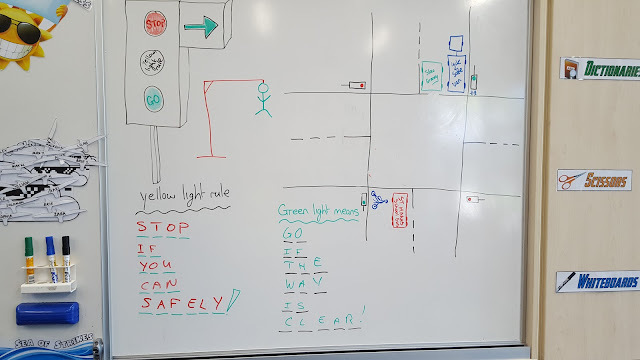 We rode around a bit and then had a lesson based on a skill such as T intersections or cross intersections, turning right or left and going around a roundabout. One life-changing moment for me was the life saver look. After you indicate on your right you have to look behind you. If you don´t do this you could be killed. Long, long ago there were no rivers in China. The rain simply drowned into the earth and eventually ran out to the Eastern Chineses Sea through the ground. In the Eastern Chinese Sea there lived four dragons; the Black Dragon with scales of midnight rock as black and dark as can be and the Long Dragon sinuous as a snake and the longest and sneakiest of all. Then there was the Pearl Dragon made of vanilla scales, and the Yellow Dragon with scales of sunlight, brightening up the land in many ways. They lived happily every day protecting the land. One day they heard a grievous cry. It was coming from the arid land. “What’s that?” asked the Pearl Dragon. “I do not know,” said the Long Dragon. “Perhaps we should investigate,” said the Yellow Dragon, so they did. When they arrived at the land, all they could see were people mourning. “The people look ravenous,” said the Black Dragon. The crops had withered and the children were weak and starving. Their parents hadn’t enough to feed them anymore and were concerned about what would happen to them. The grass had become bare and colourless; it was as hard and crumbly as clay. The Dragons felt anxious considering they had never had such famine before. “Yeah!” said the Pearl Dragon, “let’s! He’ll sort out the rain dilemma and make all the grass grow!” So off they went. “Come in!” The dragons did what was asked and hurried in. “Oh,” said the voice, who turned out to be the emperor, “Just you.” There was a long pause as the emperor watered his indoor blossom tree. As they flew home to the land, the dragons felt satisfied with what they had done. The land would soon be beautiful with crops and the people would have the plentiful food they needed to survive, all because of the dragons. They didn’t dare of what would happen if he didn’t send rain, it was all to terrifying to even watch the poor people mourn. The next morning the Black Dragon looked up at the sky. It was cloudless and had a sharp blue everywhere you looked. It was like the sky was reflecting the blue clear sea and making beautiful scenery everywhere around you. It was beautiful, but it wasn’t what the Black Dragon wanted. There was not one sign of rain at all that he knew of. He was angry and ashamed but mostly annoyed with the emperor. He had trusted the emperor since he was a young one, but now the Black Dragon didn’t have any trust in the emperor. Once again the village groaned and starved and were now living on dried grass and even clay to keep themselves alive. The famine was exasperating and it stayed like this for another few weeks. The dragons imagined a shield of sunlight all around them keeping out all droplets of rain. They had to do something. “We could carry water in our mouths and spit it into the clouds above the village,” said the Long Dragon. “But there are no clouds,” complained the Black Dragon. “But what if the Emperor catches us doing all this?” asked the Yellow Dragon. “Should we take the risk?” questioned the Yellow Dragon. “It’s worth a shot,” said the Black Dragon, so off the went. The next afternoon the dragons flew up silently to the clouds, waves in their mouths. Then they spat it out into the clouds. Little raindrops dropped to the ground like needles falling out of place. The people rejoiced, and danced and thanked the sky gods for producing rain. The crops grew and grew and soon the village could eat and eat but there wasn’t good news for the dragons however. The emperor found out and summoned them to his palace. “What do you think you are doing!” bellowed the Emperor. “We are truly sorry.” said the Pearl Dragon. “We just wanted to help the village,” said the Yellow Dragon. “As you wish your highness,” said the guard. The four dragons were locked underground and were never seen again. “Do you think we did the right thing?” asked the Black Dragon. became Zhujiang in the west. They are still there today If you want to see them in their water form. Once long ago there were no rivers in China. The rain simply drowned into the earth and eventually ran out to the sea through the ground. In the sea there lived four dragons; the Black Dragon made of shadows, the Long Dragon like a snake, the Pearl Dragon as white as snow and the Yellow Dragon with scales of sunlight. They lived happily and played every day protecting the land. One day they heard a cry. It was coming from the land. “I don’t know,” said the Long Dragon. “Perhaps we should investigate,” said the Yellow Dragon, so they did. When they arrived at the land, all they could see were people crying. “The people look hungry,” said the Black Dragon. The crops had withered and the children were weak and starving. The grass had become yellow and was as hard and crumbly as clay. The Dragons felt anxious, they had to do something; these people were hungry and starving. “Yeah!” said the Pearl Dragon, “let’s! He’ll sort out the rain problem and make all the grass grow!” So off they went. “Oh,” said the voice, who turned out to be the emperor, “Just you.” There was a long pause as the emperor watered his blossom tree. As they flew home to the land, the dragons felt satisfied with what they had done. The land would soon be beautiful with crops and the people would have the plentiful food they needed to survive, all because of the dragons. The next morning the black dragon looked up at the sky. It was cloudless and had a gradient blue everywhere you looked. It was like the sky was reflecting the blue clear sea and making beautiful scenery everywhere around you. It was beautiful, but it wasn’t what the black dragon wanted. There was not one sign of rain at all that he knew of. He was angry and ashamed but mostly annoyed with the emperor. Once again the village groaned and starved and were now lived on dried grass and even clay to keep themselves alive. The famine was exasperating and it stayed like this for another few weeks. The dragons imagined a shield of sunlight all around them keeping out all droplet of rain. They had to do something. “The emperor doesn’t care,” said the Yellow Dragon. “But what if the Emperor catches us doing it?” asked the Yellow dragon. The next afternoon the dragons flew up silently to the clouds, waves in their mouths. Then they spat it out into the clouds and then the little raindrops dropped to the ground. The people rejoiced, and danced and thanked the sky gods for producing rain. The crops grew and grew and soon the village could eat and eat but there wasn’t good news for the dragons however. The emperor found out and summoned them to his palace. “We made the village survive and happy, so I guess we did,” said the Pearl Dragon. So the dragons were buried underground and they turned themselves into rivers. The Black Dragon became Heilongjiang of the very far north, The Yellow Dragon became Huang He of the very center, the Long Dragon became Changjiang of the of the South, and the Pearl dragon became Zhujiang in the west. They are still there today If you want to see them in their water form. I went to the SPCA website and saw a cat. Its' name was Pierre. If I named Pierre a different name it would be Blanket as it looks like he has a blanket of Brown fur on him.